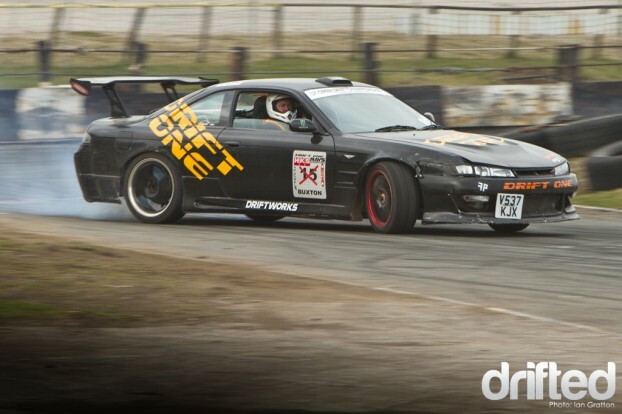 Sunday the 27th of March saw us return to Buxton Raceway in the Derbyshire peaks for the first Drift ONE event in 2011. 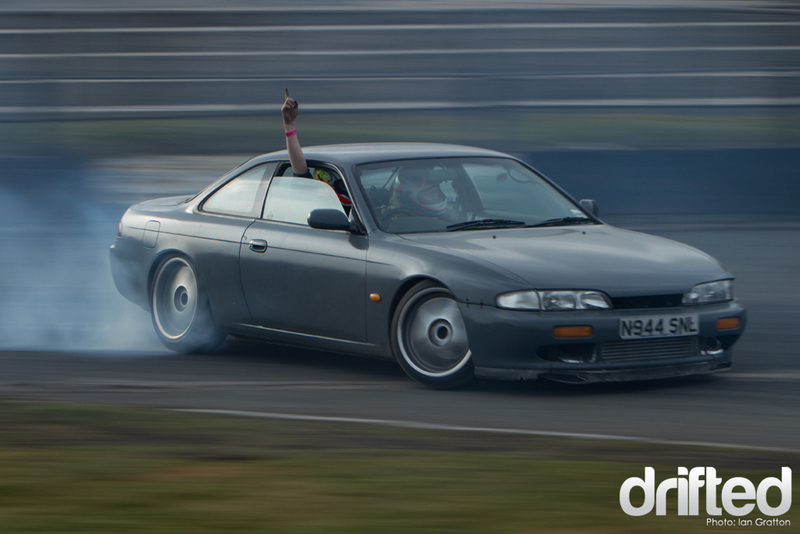 Drifting in the UK is starting to awake from its winter hibernation and it was a good opportunity to get back into the swing of things and see what the ring of steel had in store. The format of these days has changed slightly in as much as things don’t get off to a start until close to 12 noon. This gives some of the drivers a slightly less early start to their Sunday and gives the Drift ONE Taxi plenty of track time for the increasingly popular passenger rides.. With the clocks going forward that weekend it gave me an extra hours kip before I set off too which was a bonus. When you turn off the A53 the final part of the journey is along a single track road for a mile or so. The winter hadn’t been very kind to it and there was a whole host of new deep potholes to contend with. The ride was bad enough in my street spec M3 let alone some of the super low drift cars that would have made their way to the circuit today. Arriving in the car park the place was the busiest I’ve ever seen it – its great that more people are beginning to make use of these extremely cheap days. There was the usual array of S and R-bodied Nissan‘s, a fine selection of 3 and 5 series BMW‘s, an old Supra and a Ford Sierra. 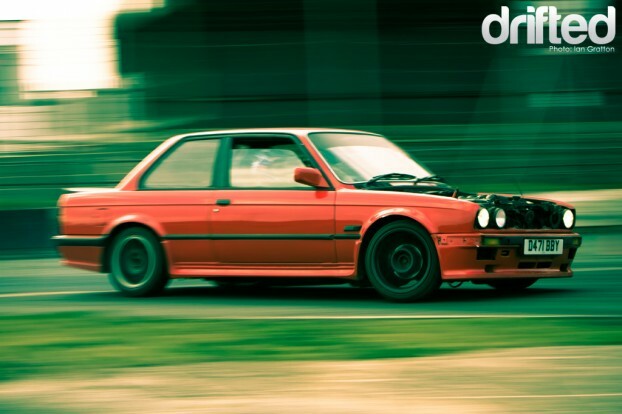 This extremely tidy E30 Mtec kitted coupe was packing the punch of an S52 engine normally found in the E36 M3. This car must be awesome with the extra power at the drivers disposal. Towards the end of the day the car seemed to be getting quite hot with the water header tank steaming away in the pits. I hope everything is ok – it seems like a brutal combo. This poor guy’s day came to a premature end after the right front wheel managed to chew through the wiring loom. Fortunately it was repaired in time to go home. When teams build purpose built drift cars wiring is always kept away from wheels – on a more road going car this modification is usually dealt with as and when its required – i.e at the track. Considering it was the first event of the year for most of the drivers there appeared to be some new found eagerness to push harder. 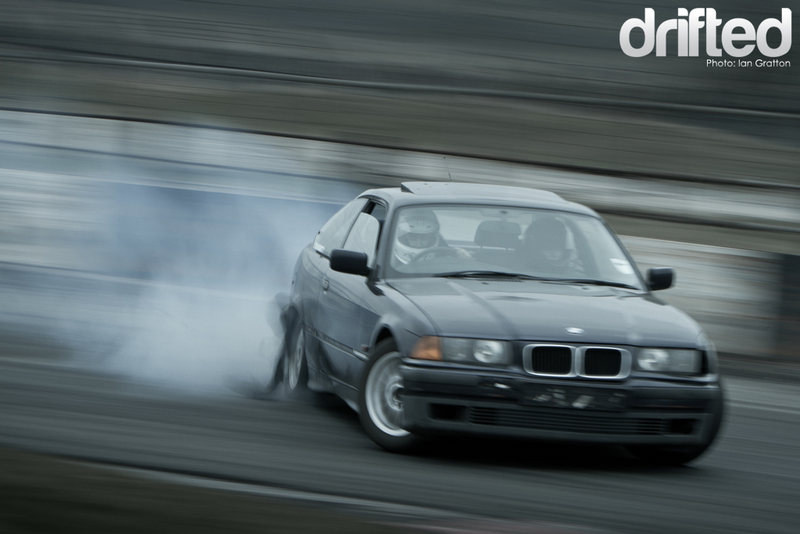 This E36 coupe was getting pretty close to the steel lap after lap. 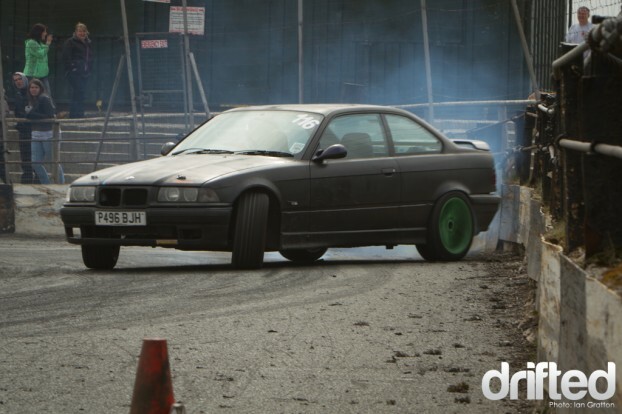 This other E36 coupe was quite content to blast round as quickly as possible kicking out lots of smoke. At the start of one of the bigger corners I could hear one of the rear tyres starting to delaminate as the tread started to part company…by the end of the corner it exploded. The usual mass of Nissan cars were in attendance – A large number of the older series 13 bodied cars – especially Silvias – all going really well. Joe-Sef’s onevia was back out after a bit of a winter refresh. This car/driver combo works well at Buxton. Its also nice to see that there is smoke in front of the car too – people are now getting a lot better at matching the lead car when twinning. The missiles that frequent Buxton don’t have the luxury of tiny dings from road cones when things go wrong or you push yourself out to the edges of the arena. When you take a knock in the ring of steel it leaves a nice reminder. This really tidy R32 skyline was showing some good consistent driving throughout the day. Its also nice to see a car wearing factory Nissan bumpers and skirts – the R32 GTS-T looks just about perfect wearing the GTR front bumper and bonnet. It really makes me miss my old black R32 when I peer through the camera at cars like this. 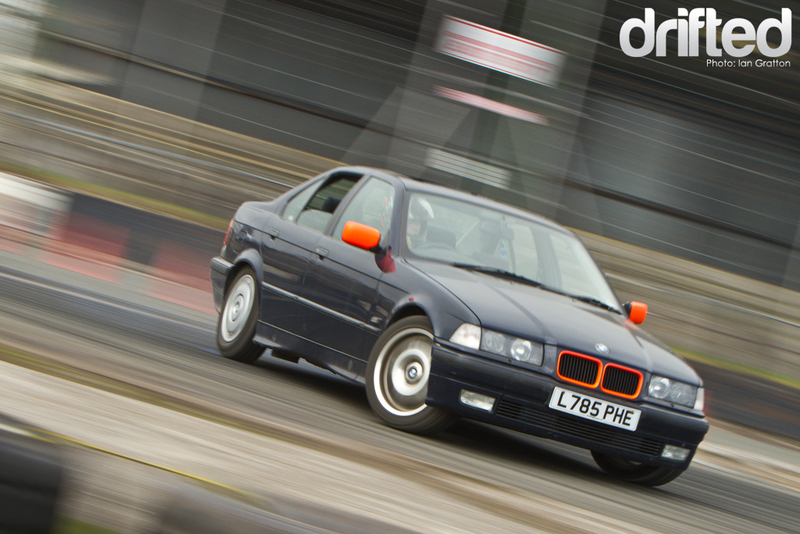 Yet another E36 – this time the family carrying 4 door variety. The driver of this car was making very late transitions into the kidney waiting for the car reach its maximum angle before flicking back to take the corner. Towards the middle of the afternoon the circuit layout was reversed in preparation for the small ODC competition. To level the playing field a little more drivers were not given a chance to drive the circuit prior to the start. This caught out some of the guys who’d been running well in the morning especially those who maybe hadn’t been to Buxton in the past. That aside the standard of driving has gone up another notch again which is nice to see. Once the competition was out of the way the open drifting continued on. Its great to see people now having enough confidence in themselves and other drivers to stay in close proximity. Its also nice to see newcomers abilities improving throughout the day – when people have desensitised themselves from the wall their rate of progress improves dramatically. 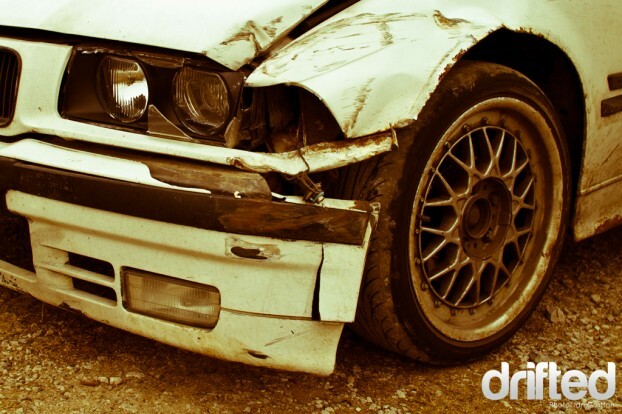 There was a few bangs and scrapes from the day including the white E36 4 door above. This car has had a hard life over the past few years but its driver can rest easy knowing the car has served its purpose. A lot of these old rear wheel drive cars would have been on the scrap heap years ago if it wasn’t for grass roots drifting extracting every last bit of life from them. Its original owner is likely driving about in something newer, more modern, more front wheel drive. 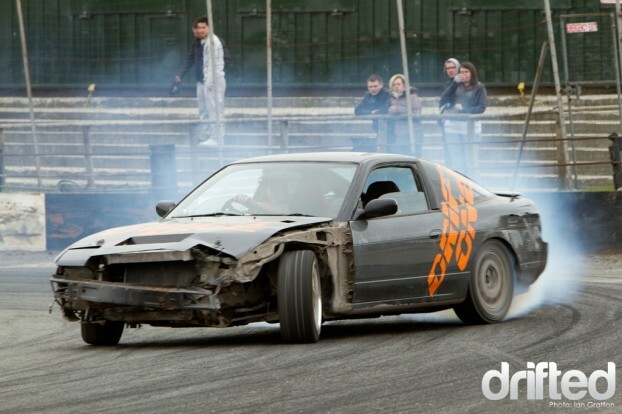 By 5:30 things were coming to a natural end – many of the spectators had left the circuit leaving a carpark full of drift cars, spent tyres, trailers and tool boxes. Joe-Sef’s onevia was sat surprisingly low with all of its body work attached – I’m sure there were many rubs and grinds as he made his way back along the uneven single track lane. 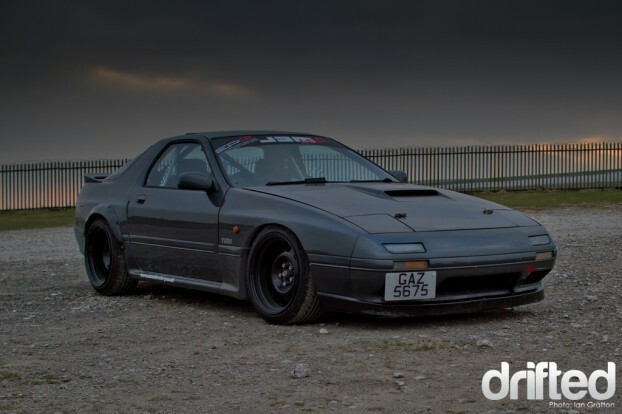 This ever so slightly evil looking Mazda FC Turbo was also lurking in the carkpark – it’s arch extensions only just managing to cover wide 10J banded steel wheels it rolls on. Just the way we like it. It had been another great day up at Buxton and considering this is the first event here in 2011 the place was a hive of activity. 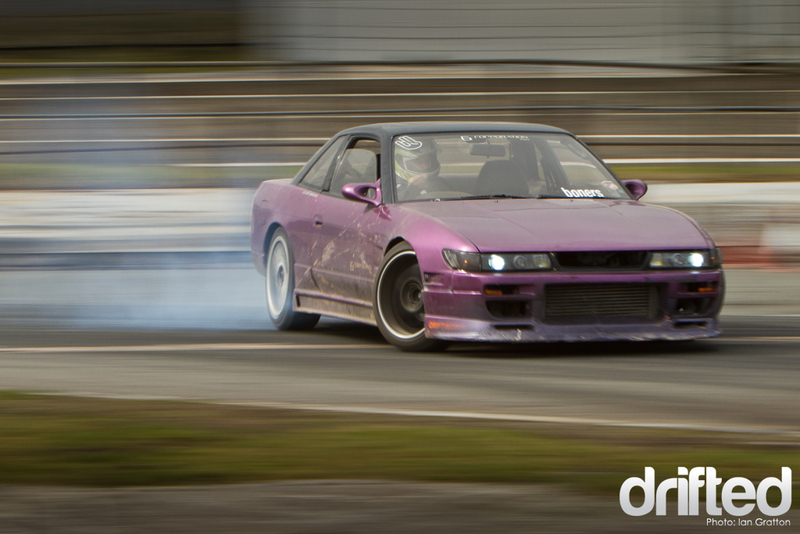 Everyone had a really great day and I’m sure many will be back for more on Sunday the 24th of April – keep an eye on the news and events area on Driftworks as more dates become available. 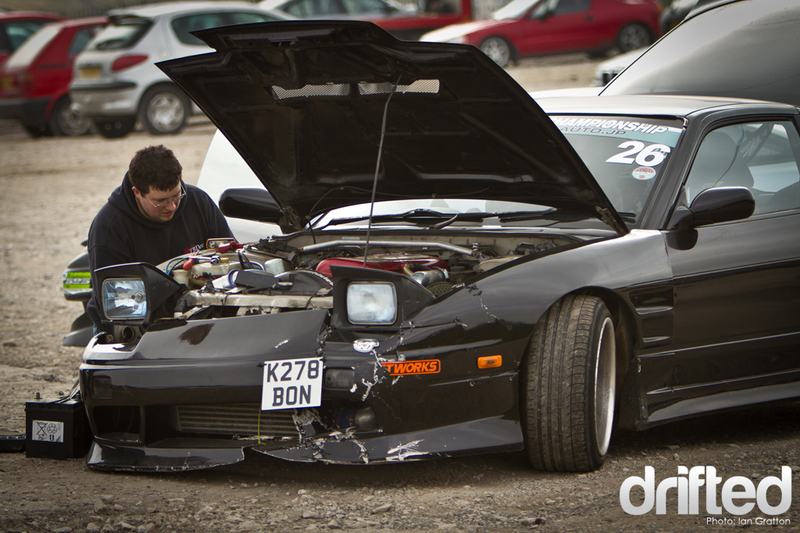 Speaking with the Drift ONE guys its likely they will try and do a Saturday/Sunday event later in the year if there is enough interest. 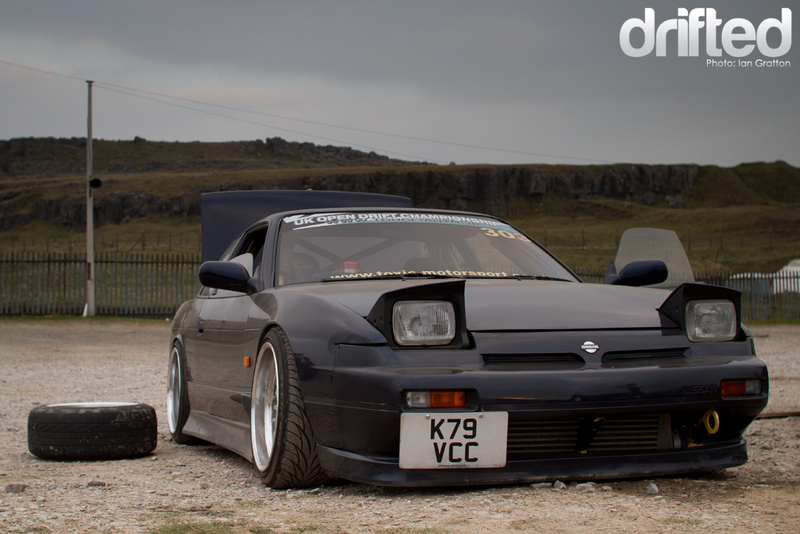 Watching the sun set over the Derbyshire peaks and tucking into a bbq reflecting on a days drifting with friends sounds like it could be fun so keep an eye out for that. I make my way back up the single track lane behind the red S50-powered E30 coupe. Even in the well sound proofed cockpit of my M3 I could hear scrapes coming from the underside of the little coupe. As the surface became more uneven the car began to leave a trail of sparks from the low slung exhaust – never a camera when you need one. 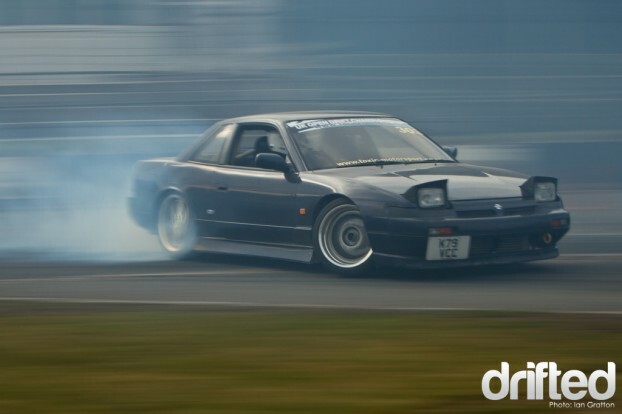 The UK drift season picks up pace from this point on. 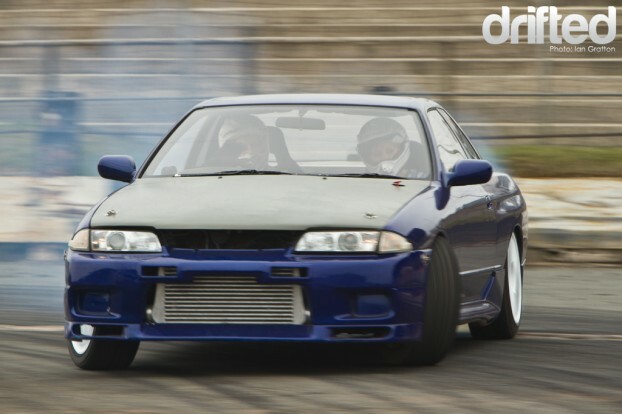 In the next month we visit another full circuit drift day over at Mallory Park, Round 1 of the British Drift Championship at Donington Park and Round 1 of the JDM Allstars Series up at Teesside Autodrome. If you are a drift fan and you live in the UK make sure you pencil these events into your diary as they are not to be missed! We’ll no doubt see you there.